The student who heckled Tony Blair over possible war in Iraq has said he was speaking for the British public when he shouted down the prime minister. 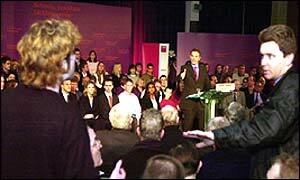 Iain Wilson ambushed Mr Blair as he made a key speech in London about reform of public services. The prime minister told the 22-year-old he would not have been allowed to make such protest under Saddam Hussein's Iraq. But Mr Wilson told BBC Breakfast the way he was dragged away was not much different from the way he might have been treated in Iraq. Mr Blair was using the speech to argue the Iraq crisis should not distract from the drive to improve public services at home. That domestic programme was expected to top the agenda as Mr Blair met his top ministers without officials at a political cabinet meeting on Friday. On Thursday night, London School of Economics student Mr Wilson managed to slip into the hand-picked audience after borrowing a friend's Labour Party card. He had only planned the demonstration about an hour before the speech. In reply, Mr Blair said: "This is a democracy and you are entitled to make your speech but I am making my speech now and you can go and make yours somewhere else." But Mr Wilson told the prime minister to speak about possible war in Iraq "when you are going to kill thousands of Iraqis". On Friday, Mr Wilson said many people had congratulated him on his protest. "I basically hoped to get my message across to Tony Blair," he said. "As it is, there are millions of people who would like to tell Tony Blair exactly the same thing. "Hundreds of thousands marched in September, there are going to be loads marching on 15 February. "I just wanted to get the message across to him that this country is opposed to a war against Iraq." Asked about Mr Blair's comment that such he would not have escaped with such heckling in Iraq, Mr Wilson replied: "I did not get away with it there. "You can see them dragging me out and pushing me out. I do not see there being that much of a difference. "I wasn't able to freely express myself. He had surrounded himself with a room full of people who had been specially selected. "The fact that I had smuggled myself in there to actually get some sort of dialogue with the prime minister I think says quite a bit." A pre-emptive strike against Iraq would create "mayhem" in the Middle East, predicted Mr Wilson. The student argued it probably took more courage to defend the government's position than heckle Mr Blair. "It's got to take a lot of nerve for Tony Blair to stand there and say war is justified because it is not," he added. Mr Blair has repeatedly argued that Iraq must be disarmed of its weapons of mass destruction peacefully or face force. The United Nations weapons inspections team will report to the UN Security Council on Monday amid signs of international splits. Russia, China and France, all permanent members of the security council have voiced their concern about possible war. That has led to America and the UK looking increasingly isolated. Mr Blair says he wants a second security council resolution before any military action. But an "unreasonable" veto should not be allowed to prevent confronting Saddam Hussein, he argues. "If we go bombing Iraq it's not really going to achieve much"